Product prices and availability are accurate as of 2019-04-20 04:06:06 UTC and are subject to change. Any price and availability information displayed on http://www.amazon.com/ at the time of purchase will apply to the purchase of this product. 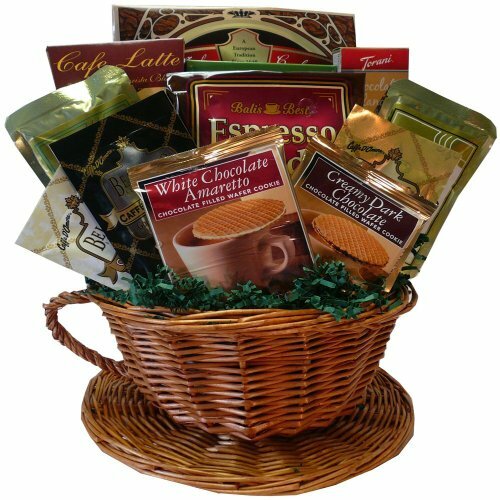 This whimsical gift basket is filled with premium coffee and great gourmet go-togethers cleverly presented in a woven wicker coffee cup! It's a great choice for any coffee lover to celebrate a special occasion or show your appreciation, even if you are miles away. Each gift is hand crafted, shrink wrapped, tied with a bow for presentation and ready for gift giving. Include a personalized message with your order by selecting GIFT during check out. Wicker Cup and Saucer Basket.